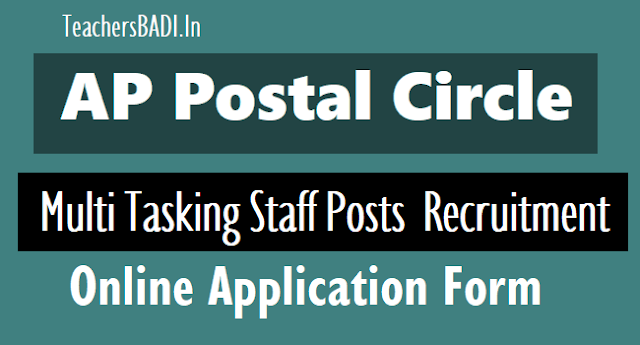 AP Post Multi Tasking Staff Posts Recruitment, AP Postal circle Multi Tasking Staff Posts online applying last date, India Post AP MTS Online Application Form, Hall tickets, Selection list results and more details @ http://appost.in/. 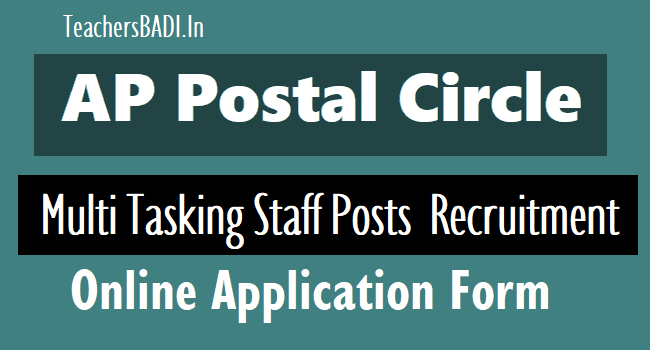 AP Postal Circle, Vijayawada -Multi Tasking Staff Posts : Department of Posts, Office of the Chief Postmaster General , AP Postal Circle has issued a recruitment notification on 12-04-2019 and the Department of Posts invites applications from the eligible and interested Candidates to fill up 52 Multi Tasking Staff Vacancies of the year 2019 in AP Postal circle, Hyderabad. Applications are invited from the eligible candidates to fill up the posts of Multi Tasking Staff in the following Units in AP Postal circle in the pay scale of Rs18000/- in level of pay matrix as per 11h CPC +admissible allowances prescribed from time to time in accordance with Department of Posts (Multi Tasking Staff Group C , Non- Gazetted) Recruitment Rules 2015 notified in GOI Gazette No GSR 383(E) ,Gazette of India Extraordinary , Part II section 3 Sub section (i) dtd 14-5-2015. The aspiring applicants are requested to access the AP Postal official website for all other full details like vacancies eligibility criteria etc., Application are to be submitted online and the registration for online applications commences from 12-04-2019 and last date of registration of applications online is 12-05-2019. Selection Procedure: Based on written exam. Last date for primary registration: 28.02.2019. Last date for fee payment at Post Offices: 05.03.2019. Last date for submission of application: 08.03.2019. Is it sure timinges or not sir? Is it sure timingrs or not? I want D.Ed 1st year previous papers. Where and how can I get those papers. I want D.Ed 1st year previous papers. Where and how can I get it. Time Table has not been announced yet... please wait few days..we will update soon, when it will be announced..
Giri gaaru...inka official ga dates announce kaaledu.. When will Release AP D.Ed 1st Yr Time Table 2014? Okasaari Home page lo Andhra Pradesh Latest Updates lo Choodandi ..
leda AP D.Ed Fisrt year 2014 Time Table ani type cheyand..
presently AP has not announce the D.Ed First Time Table, When I will be Announce the Time Table, We will inform through Faebook.com/Teachersbadi ors Twitter.com/Teachersbadi.......So, Keep touch with us. hello sir ts D Ed 1 st year exams eppudu untai sir?? kondaru sep 25 nundi antunnaru adi entha varaki nijam sir??? September Last week leda November First Week Untayee. Meeku Exams Fee Dates Official ga vasthe E nelalo Exams Vuntaye Thelusthayee..
Telangaana State lo DEd First Year Batch Last Working Day is 17-10-2015. So, TS DEd Vaarki October 2nd Week lo Exams Vuntayee. Exams November First Week lo Vuntayee..
Meeku November lo Untayee Kaavochu..
sir asalu e monthlo vuntaya sir please tell me sir...memu chadavaliga sir. sir, please announce the d.ed first year exam dates. asalu exams vishayam lo oka planing antu ledu.. mekishtamochinattu net lo exams dates marusthunnaru..students life tho adukuntunnaru.exams currect ga eppudu start chestharo thelisthe pettandi lekapothe ledu..
1st year d.ed exams start 19-01-2016.see the bseap.org. best of luck all students. Download the Time Table from the above given link..